The Republic of Crimea's declaration of independence (English translation) was actually adopted on March 11, but was not to go into effect until and unless endorsed by this Sunday's popular referendum. Yet sure enough, Crimea's population, more than half of whom identify as Russians, apparently voted in favor of the split from Ukraine. Many minority Crimean Tatars - and possibly ethnic Ukrainians as well - planned to boycott the vote, though that still doesn't explain the referendum's passage by a suspiciously high 97 percent. It's difficult to verify whether the election was free and fair, as it was held under military occupation and against the will of Ukraine's government, with European election observers refusing to participate in validating the outcome. Even some of the regional leaders who arranged it did not come to power legally within the Ukrainian constitution (though they claim the same of the current Ukrainian government in Kiev). Given all these issues, it may never be known whether a majority of Crimea's people truly do want the split with Ukraine. A political geography detail left out of many reports is the fact that, under the Ukrainian constitution, Crimea is actually divided between two different regional governments. The majority of the peninsula falls under the jurisdiction of the Autonomous Republic of Crimea - a special regional administration with more power than Ukraine's provinces but less power than a U.S. state. But another sizable chunk is governed by the special municipality of Sevastopol, a city which is not part of any Ukrainian province. Crimea's process of exiting Ukraine was endorsed by both the parliament of the Autonomous Republic of Crimea and the city council of Sevastopol, though as previously mentioned, both bodies are led by politicians installed under questionable circumstances during the past few weeks. By agreeing to this declaration, the active governments of the two administrative areas have effectively agreed to unite into a single independent country for now. 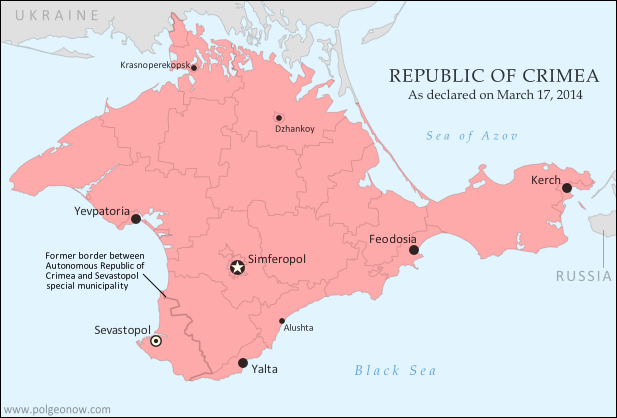 Although the process involves declaring Crimea and independent country, the goal is actually to join Russia as an autonomous republic within that country's federal system (once united with Russia, Sevastopol will likely return to its status as a separate municipality). Accordingly, the newly declared Republic of Crimea has already applied to join the Russian Federation (i.e. Russia), and Russian president Vladimir Putin has already signed a treaty to allow Crimea's admission. However, the treaty will need to be ratified by Russia's parliament before Crimea can become part of the country under Russian law. The key to acceptance by a new country into the international community is diplomatic recognition from other countries. Given the way it came about, Crimea is unlikely to receive recognition from many of the world's states. However, it has already joined the club of breakaway states with at least one recognition, after its independence was officially acknowledged by Russia. An independent Crimea has also apparently been endorsed by three other mostly-unrecognized pro-Russian breakaway states: Abkhazia, South Ossetia, and Nagorno-Karabakh. Is Crimea a Real Country? Though most lists of the world's countries include only those with recognition from the United Nations, other proclaimed nations can sometimes be described as de facto ("in actual fact") independent countries if the reality on the ground shows they aren't part of any other country. Since Crimea is clearly no longer controlled by Ukraine and is not yet claimed by Russia, it probably could be placed in this category. Similar cases which are often described as de facto independent countries are Northern Cyprus, which is recognized only by Turkey, and Abzhazia and South Ossetia, which are recognized only by Russia and a few others. These claimed countries may be puppet states - under the close political influence of a neighboring nation - but through history that often hasn't stopped countries from receiving recognition and even being members of the U.N. (think of eastern Europe during the Cold War, or Iraq and Afghanistan after the U.S. invasions). A country can be de facto independent without being established through a democratic process or within the laws of the country it's splitting from. Though unilateral declarations of independence can be tricky to trade in for diplomatic recognition these days, many modern countries were created this way, from Croatia to Bangladesh to the United States. So the questionable circumstances surrounding Crimea's declaration and referendum don't actually disqualify it from being considered a country. In fact, the Crimean declaration of independence made specific mention of Kosovo, another claimed country which declared independence after being occupied by foreign powers - in that case, NATO intervening to protect ethnic Albanians from the government of Serbia. Though Russia has been among the strongest opponents of Kosovo's independence, supporters of Crimea's secession from Ukraine have been quick to point to a judgment from the International Court of Justice (ICJ) which ruled that Kosovo's declaration of independence did not violate international law. Graphic of the flag of Crimea is in the public domain (source).